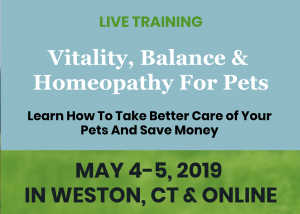 Helping Your Pets Using Vitality, Balance and Homeopathy - Holistic Actions! This is both an in-person meeting (in Weston, CT) and will be streamed and recorded for anyone who registers (whether or not they can attend live). 10am-1pm will be a discussion of the HA! Vitality and Balance model and how it integrates with the modern medical model. We’ll break for lunch and discussion and some early Spring bird watching. Then regroup for an afternoon presentation of the specific steps of homeopathic treatment that you can learn today, how homeopathic medicines are made and dosed, and more.